A woman. A home with a library. A room filled with books, with book spines turned against her, a scaring and inviting room. In the woman’s striving to overcome her educational inferiority complex, her exaggerated respect for – and ambivalent attraction to – books, a great part of her life is devoted to conquering the world of the “backs”. Something she has to do without – well, even better than – the Already Initiated, who also happen to be her closest ones. And even the people on the bench outside the grocery seem to read Barthes. At the same time laughing at the hardships of this tackling of the world’s classical literature, one reads a heartbreakingly beautiful and poetical depiction of the grief in losing a child. In the emptiness of what never was allowed to exist, the sharp lines between life and fiction become fuzzy, and a new opening for literature’s power and unruly possibilities is created. Handlingen was awarded the 2012 European Union Prize for Literature. Sara Mannheimer grew up in Gothenburg and has studied in the USA, the Netherlands and the Czech Republic, before settling down in Stockholm. Besides writing, she runs the glassworks “Stockholm Heta Glas”. Her novel "Reglerna" was nominated for the August Prize and won the Borås Tidnings Debut Prize. 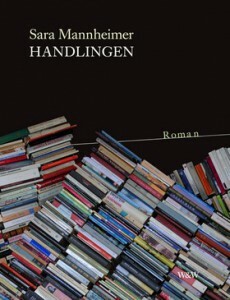 "Handlingen" received the 2012 European Union Prize for Literature. In her language high-flown terms mix with everyday language, scholarly terminology with clichés and, first and foremost, irony mixes with the most clear-sighted naivety. I am constantly stricken with cheerfulness while reading this profoundly serious book. The narrator gets herself in difficult situations that always have an amusing part. ‚Handlingen‘ gives me a strong urge to read – and to live.